Cowbirds Invaded My Porch Nest! I jumped out of my skin when a tiny bird whizzed past my ear as I was watering my ferns. 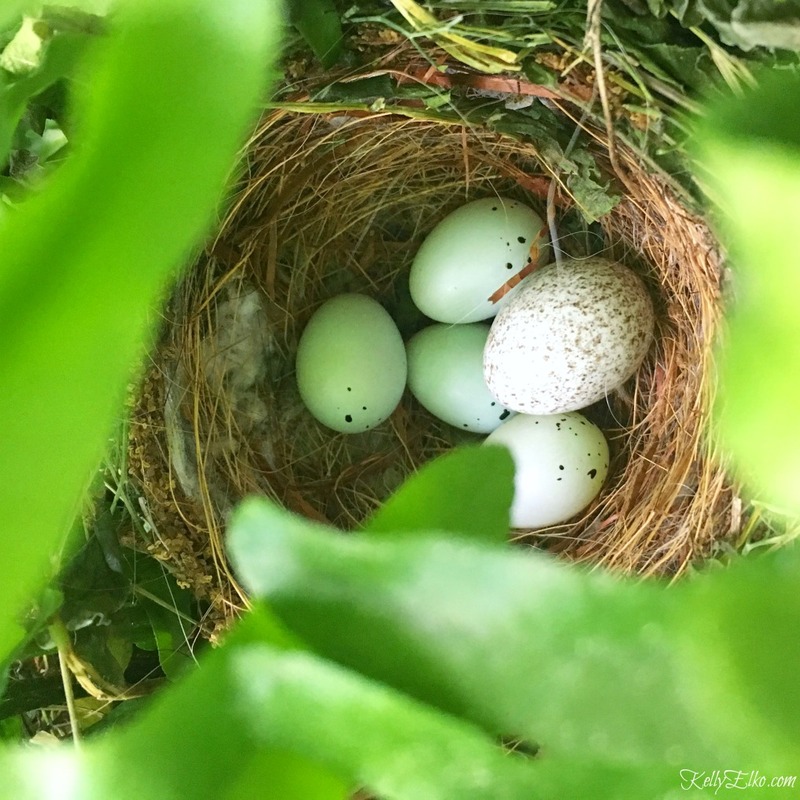 I parted the leaves and peered in to discover a perfect little nest with five tiny eggs. Let’s play Which One Doesn’t Belong. One egg is not like the rest. Ever heard of a cowbird? I hadn’t until I posted this pic on Instagram and a flood of comments poured in. Cowbirds are brood parasites – meaning they lay their eggs in other birds nests then let other unsuspecting birds raise their babies! Each cowbird can lay up to 36 eggs in on spring. Cowbirds often hatch first and will sometimes try to get rid of the competition by pushing the other eggs out of the nest! If the other babies do manage to hatch before they are flung from their home, the cowbird is so loud and demanding that the poor parents end up giving them most of the food and the other birds may die of starvation. P.S. Did I mention it’s illegal to remove these eggs from nests! Why oh why did I ever google cowbird? I was happier when I was clueless about the cut throat nature of birds. I need a strong cocktail asap – I think I’ll whip up a batch of my Summer Sangria. Maybe some retail therapy will help me forget – here are some of my favorite weekend affiliate sales. On a brighter note, my peonies are bursting into bloom and they smell amazing. 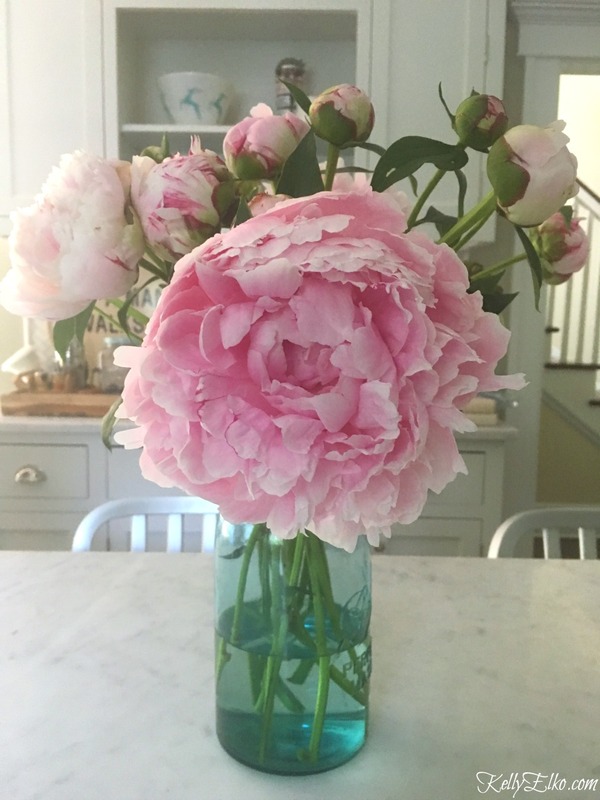 Read my Tips for Planting Peonies so you can have armloads of these gorgeous blooms. Yep those cowbirds are awful! Best to take the large egg out when you find it and let the other eggs hatch. They also invade our feeders every spring and all the other birds have to fight to get the food. Those mama cowbirds just drop there eggs all over town! Oh no! I just learned something. Thanks for sharing this. Did you take the other egg out? I just love this time of year so much. I was doing yard work today and loving it. I wish Spring & Summer would last all year long. I love spring – summer way too hot for me – and I live for fall! Winter I can handle for a few days around Christmas! I learned it’s illegal to remove the egg (not that there are any egg police watching me)! Ha! My dad used to call them welfare birds….. I have seen the Michigan Cowbirds here in Texas. Did you remove the egg from the nest yet? I learned it’s illegal to remove them so I’m pleading the fifth! So did you get rid of the bad egg…????!!!!!! Pleading the fifth since it’s technically illegal to remove the egg! Oh please tell me you got rid of the alien egg!!! It’s illegal to remove these eggs so I’m pleading the fifth! I discovered this many years ago when a family of cardinals were at the feeder…two adults were feeding their young….four young cardinals and one young cowbird…they were keeping mommy and daddy busy squawking to be fed….. So funny how nature works! I was wondering about the cowbird egg. Did you take the egg out so you can save the other birds ? I think I would have to only because the cowbird throws thier eggs everywhere. Interesting info. Thank you. It’s illegal to remove these eggs … so I’m pleading the 5th! google is the devil! i swear it makes me worry too much. I can’t stop thinking about it! Cowbirds have made a much better birdwatcher. I have been very careful to distinguish them from other birds. I do not permit them on my feeders or on my property. I may have to get some binoculars! Wow that’s so crazy and sad. Hopefully the other birds will live. I have never heard of those either weird. Your Peonies are gorgeous mine bloomed here at my new house a while ago. They are gone now but I did manage to cut a few and place on my kitchen island. hope you had a wonderful Memorial Day weekend! I have four nest with eggs in them… I will be checking them… I see cowbirds in my yard offen… wasn’t aware it was illegal… sorry those eggs need to go… your peonies are beautiful… I received one this year for my birthday… home it blooms next year. Oh I hope you get tons of peonies Sabra – and the cowbirds stay away! And who would know that there will be 1 less cowbird?